It’s amazing to see Alex and Grace on the site, and I think Steve wrote a wonderful article. I’m headed back to the hospital for Christmas break, and I’ll be updating the blog regularly – starting now. Here’s a (very) quick 30-second video, as a re-introduction to the project and a few of the people involved. This guide provides an inexpensive way to create an SMS communications network to enable healthcare field workers as they serve communities and their patients. The steps are purposefully simple – the system is easy to set up, use and maintain. 1. Who might benefit from a text-based communications network? 2. What are the benefits for my hospital, clinic or organization and the people it serves? 3. What technology do I need? 4. Do I need an internet connection? 5. How expensive is an SMS network? 6. How do I distribute communication credit? 7. How much staff training is required? 8. How much time does it take, per day, to manage the SMS network? 9. How do I conduct SMS training? 10. What is the best power source for the cell phones? 11. Do the CHWs communicate with each other? 12. Where can I find more information on FrontlineSMS? FAQ #1: Who might benefit from a text-based communications network? 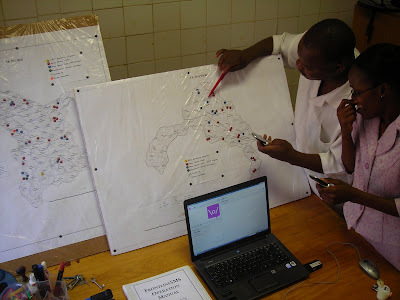 In the summer of 2008, an SMS network was implemented at St. Gabriel’s Hospital in rural Malawi. The hospital serves ¼ million people, spread throughout a catchment area 100 miles in radius. St. Gabriel’s recruited 600 community health workers (CHWs) to serve as volunteer healthcare representatives in their villages. Disconnected from hospital services and resources, the CHWs’ ability to help patients was limited. Hospitals, clinics, and organizations faced with the defining challenges of rural healthcare – namely, distance and the isolation it breeds – are set to benefit from a low-cost SMS network. Given specific steps and tools to connect individuals, SMS (“short message service”) can provide the missing link – between a hospital and its field worker, patients, support group members, or CHWs in their respective villages. Ultimately, the aim is for benefits to fall upon those served by the health network. See FAQ #2 for an outline of the benefits derived from a newly implemented SMS program that is providing connectivity for a rural healthcare network. FAQ #2: What are the benefits for my hospital, clinic or organization and the people it serves? The listed benefits developed organically from a particular hospital’s needs. Undoubtedly, future demands will uncover new functionalities. For example, the hospital in Malawi is exploring the use of FrontlineSMS’s ‘Forms’ function to collect structured data regarding the status of palliative care patients – information that can quickly be exported to donors and organizations supporting those patients. FAQ #3: What technology do I need? • As long as the cell phones get service and function on your local network – they can send/receive text messages – they will work with FrontlineSMS. Motorola V195 phones were chosen for the program in Malawi because of their low cost and ease of use. The Nokia phones were chosen for similar reasons – teaching texting using the Nokia models (6100 and 6210) was straightforward. The steps for sending an SMS with the Motorola V195 were slightly more complex. • Each distributed phone was labeled with the hospital logo. This was important for ownership and accountability, along with community transparency and health worker status. • I had the Malawian Department of Surveys print a map of the hospital’s catchment area. On this map, color-coded pins were placed, showing where distributed phones are located (along with each CHW’s program type, e.g. Home-Based Care or ART Monitoring). 1. Consider the experience of the user. In most situations, simpler is better – sending and receiving an SMS is meant to be easy. FAQ #4: Do I need an internet connection? FAQ #5: How expensive is an SMS network? • The pilot network includes 75 community health workers (CHWs) and 10 members of the hospital staff. • During the final weeks of the implementation period (weeks 7 and 8), an average of 10 messages were received from the hospital per day. The number of responses by the hospital (along with new patient tracking requests) varied. • Once the phones are distributed, the only running cost is the rate per SMS. Given that one SMS costs 10 cents, and they are free to receive, the program is running on just over $1/day. So, $4,000 will fund the SMS network for a little over 10 years. FAQ #6: How do I distribute communication credit? • Celtel, the local network provider, has a ‘Me2U’ service that allows a user to send communication credit (“units”) from one phone to another via text message. • Every phone that we distributed had a 2-digit identification number engraved on its case, specific to that phone and SIM card. • Using the keyword and auto-forward functions in FrontlineSMS, we automated the entire top-up process, allowing the CHWs to request automatic unit refills. • For example, the owner of phone #11 sends a message to the hospital, “11 units” which is recognized by FrontlineSMS. FrontlineSMS then sends a message to Celtel’s Me2U service, requesting that phone #11 receive another dollar of credit. Other options include passing large quantities of units to trusted individuals, such as CHW leaders, coordinators, or other staff who have regular contact with those receiving phones. The key to maintaining accountability is making it clear that FrontlineSMS documents every message received by the hospital. Be sure it is understood that the communication credit given to your contacts should be used to communicate with your hospital, clinic, or organization. FAQ #7: How much staff training is required? No technical experience is required for implementing or sustaining an SMS network. The nurse in Malawi managing day-to-day communication, using FrontlineSMS on the hospital laptop, had never used a computer before the SMS program was introduced. Within the first week, the hospital staff understood the functionalities of FrontlineSMS – for this reason, the uses of the SMS network developed organically, shaped by the needs of the hospital, the CHWs, and the patients they serve. FrontlineSMS also has a built-in Help guide, which explains in detail each function, including forms, e-mail, and keywords. The keywords and their respective automated action (e.g. auto-forward, auto-reply) were all created on the ground, and I have absolutely no technical background. FAQ #8: How much time does it take, per day, to manage the SMS network? Towards the end of the pilot period (weeks 7 and in Malawi, two members of the hospital staff were spending 15 minutes every morning and 15 minutes at the end of the workday managing incoming and outgoing SMS data. This management time (an average of 30 minutes per day) included reading new messages, responding to urgent requests, forwarding CHW-to-CHW messages, passing on patient updates to relevant hospital staff, sending out patient tracking requests, and processing other outgoing texts. FAQ #9: How do I conduct SMS training? 1. Start with the basics. The first step displayed on our training posters? Open the phone. 2. Keep the training groups small. 3. Take simple steps to make your instructions outstandingly clear – we made posters showing which buttons to press. 4. After each ‘lesson,’ have a member of the group lead the others through what they learned (e.g. after teaching the group how to check for new text messages in the phone’s inbox, have a participant repeat the steps). 5. Poll the group to find out how many have used a cell phone before. Have the experienced participants guide others through the SMS steps. 6. Have the group practice texting something simple (e.g. “Malawi”), then something more difficult (e.g. their full name and birth date). 7. Have expectations for the group prepared (e.g. what will be communicated, and when they are expected to communicate). 8. The most committed volunteers received the first phones. This distribution method contributed to the success of the pilot program. The training in Malawi was conducted in Chichewa by hospital staff. The staff running the training sessions knew the CHWs, and were used to speaking to groups. FAQ #10: What is the best power source for the cell phones? • When asked, “Who has access to electricity?” every CHW said they could charge the phones on their own. This turned out to be a half-truth – they had to pay a small fee to charge the phones at a local barbershop, as an example of a local solution. • We created a local charging station, next to the hospital, where the CHWs could charge their phones free of charge. • I brought hand-powered chargers, which simply did not work. • As a short-term solution, CHWs in the most remote locations were given battery-powered phone chargers (which provide 2-3 full charges per AA battery). • For sustainable, remote, off-the-grid charging, individualized solar panels may be the best option. Solar panels will power the SMS network for the pilot program in Malawi. FAQ #11: Do the CHWs communicate with each other? Absolutely. 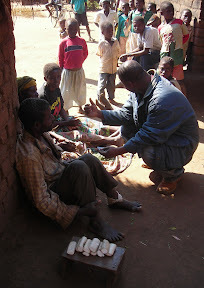 This was one of the first questions raised by the CHWs in the pilot group in Malawi. CHW-to-CHW communication is vital for group mobilization, and has a large impact on day-to-day CHW activities. It’s important to realize, however, that FrontlineSMS will not track messages between phones in the field. If one CHW wants to contact his colleague many miles away, they are asked to send a message to the hospital – along with directions to forward the message: e.g. “Send to John: The support group will meet this Saturday, at 10 o’clock in the morning. From Dickson.” This system ensures that all messages are accounted for. FAQ #12: Where can I find more information on FrontlineSMS? Visit www.frontlinesms.com for more information on the free, open-source program. The site includes a detailed description of the software, demo, map of current users, and download request form.